Vase fotografije odstampane na slikarskom platnu. Lifelong quality. 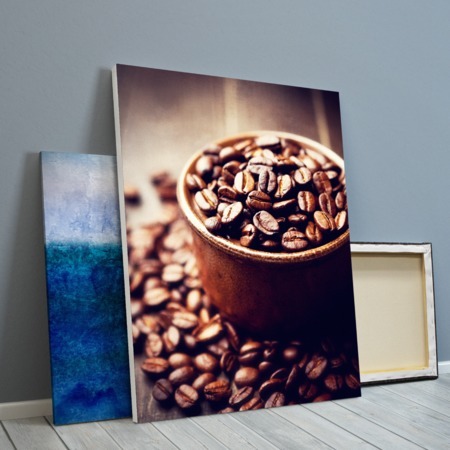 We offer a 100 year guarantee against fading on our canvas prints, because we use only the best polycotton canvas, FSC-approved wood frames and solvent-based inks. Which other companies are confident enough to offer such a guarantee? Custom sizes at no extra cost. Our production technique allows us to create canvas prints of any size you wish up to 1.5m in either height or width. We use 44mm deep kiln-dried redwood for the frames which is cut and assembled to your exact size of print. No re-tensioning needed. Because we stretch your canvas print to optimum tension before we despatch it, there is no need to re-tension it after three or six months. There are four ways we can print your canvas, illustrated above. All options cost the same. Canvas prints are despatched within 12 working days. Canvas prints are standard rated for VAT. Unfortunately it is not practical for us to supply samples of canvas prints. If you have any questions about the prints or how to supply a photograph for printing onto canvas, please feel free to contact us using our Freephone Design Advice Line on 0800 077 6467 and we will be delighted to help.